The electro-winning system [SX-EW] is a step in the right direction as the mining industry attempts to develop methods that have less of an impact on the environment. Really, it's a huge step since it eliminates tailings impoundments, which are unsightly and can cause water pollution, and smelting, which can cause air pollution. It only works on oxide ore, whereas the majority of the ore at Rosemont is sulfide and will not dissolve into solution in a reasonable period of time. Therefore, leaching can be used on some 14% of the ore, or approximately 59 million tons. Sulfuric acid, the leaching agent, is brought on site in large tankers. The sulfuric acid is diluted and sprayed or dripped over oxide ore, which dissolves the oxidized minerals completely in the solution. The solution, “pregnant” with the dissolved metals, is then piped to the SX-EW plant that separates out the copper into 99% pure bars. The copper is ready with no need for smelting. 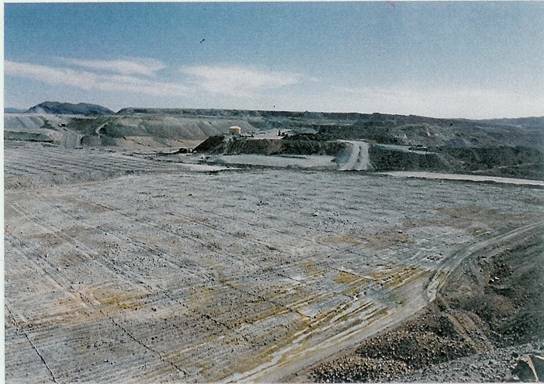 The waste solution is piped to on-site holding ponds, which are securely lined, awaiting the next load of oxide ore to be placed on the leach pads. Ideally, this system is a closed circuit and is considered environmentally safe. However, there are two conduits to environment impact. 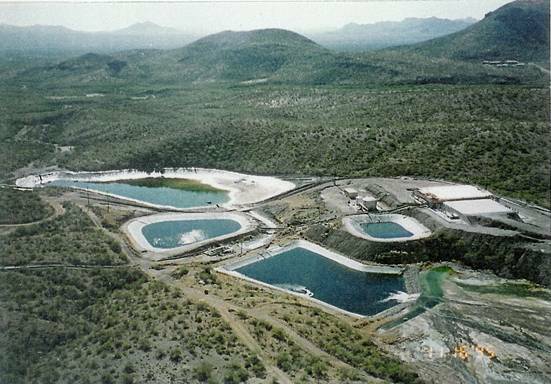 First, the leach solution is stored in open ponds (until the mine is closed then it is put in barrels and taken to toxic waste dumps). Second, the leach solution and the sulfuric acid can spill as they are piped around the facility. There is data to show that these spills impact groundwater—even two miles away. As the leach solution is reused, the unwanted metals concentrate into a very toxic solution, which sits out in open ponds, waiting to be piped back to be sprayed on fresh ore on the leach pads. The data on the table on the following page shows the "Characteristics of Leach Solution, which is a toxic hazard. Whereas these ponds are an inevitable part of mining and are considered to be an improvement over tailings impoundments, it is questionable if they are appropriate for a National Forest setting with its requirements for beneficial use. All spills were on-site in mill region, principally due to broken pipes. Leach solution content varies according to the step of the process, as is seen by table above. Since Bagdad operations did not have a railway to the site, the chemicals and copper concentrate had to be trucked in and out of the milling/leaching area. There was a mountainous road that contributed to a number of truck accidents. Bagdad operation is using an alternative route at this time. There is data to show from Community Water Company, which wisely did extra water testing for sulfates, that the spills do impact groundwater, even though the groundwater table is at several hundred feet. I noticed spikes in sulfate and TDS in the Community Water Company. Naturally, I wondered what caused them. It was later that I found out about the spills and wondered if there was any correlation. 1) They did not necessarily occur on the same test date. 2) There was a gradual increase, a spike, then a decrease. 3) The increase was of sulfate, but not of other common metals. The sudden increases, then lowering of the levels, are not indicative of a traditional sulfate plume, or of a testing abnormality. The problem in analyzing the data was finding the time frame that the sulfuric acid would flow from the spill in the mill/leach area to the public supply wells. I finally found the magic number! The trip takes 39 months. Of six correlations available, four in a row were 39 months, then 24 months, then 21 months. It could be expected that with time the spills make a path to make the trip faster. *Note: Spill data given in red.